Primary Natural Resources coal, copper, rice, sugar beets. JAPAN IS AN ISLAND nation occupying a long, relatively narrow mountainous archipelago of four large and about 3,000 smaller islands on the northwestern edge of the PACIFIC OCEAN. The main chain of islands hugs the coast of the Asian continent from RUSSIA in the northeast to CHINA in the southwest for about 2,361 mi (3,800 km). From north to south, the four largest islands, constituting about 98 percent of Japanese territory, are HOKKAIDÔ, Honshû (the main island), Shikoku, and Kyûshû. Separating Japan from the mainland are the Sea of Okhotsk to the northwest, and the Sea of Japan and the East China Sea to the west. The closest point of contact with continental Asia is with the Korean Peninsula, about 124 mi (200 km) across the Korea Strait. Extending 603 mi (970 km) further south from Kyûshû (almost to TAIWAN) are the more than 200 Ryûkyû Islands, administered as Okinawa Prefecture, after the name of the largest island. Far to the southeast, in the Pacific north of the Marianas lie Iwo Jima and the small group of Bonin Islands (known as the Ogasawara Islands in Japan). Although Japan looks small alongside its huge neighbor of China, it is larger than any of the countries of Europe. Its area is slightly smaller than California. Japan emerged in the 6th century C.E. as a variant of the great East Asian civilization developed in ancient China. Its relative closeness to the continent of Asia facilitated the borrowing of China’s sophisticated language and institutions, but the distances were far enough that in premodern times Japan was also fairly isolated from affairs on the continent. The country was never successfully invaded from the continent (the famous failed attempt of the Mongol Empire to extend its rule over Japan in the 13th century was the only serious attempt to do so). Thus, Japan was both part of the Asian civilization derived from China but had a distinct insular (island) character. Some observers see Japan as remaining insular, if not provincial, to this day and compare Japan’s national character to that of Great Britain (although the distance separating Japan from Asia is five times the distance between England and the European continent). Japan’s natural isolation in the world was magnified by its artificial isolation due to a political decision in the early 17th century to impose the “closed-country” policy, expelling Christians and restricting contact with the West to a single Dutch fleet a year. The closedcountry policy lasted until the middle of the 19th century—200 years of willful isolation from outside developments. The mapping of the land and systematic observation of Japanese geography began quite early, in the 8th century, when the government compiled regional geographies (Fûdo-ki) for each of Japan’s provinces (KUNI). But even though Japanese pirates terrorized the coasts of Asia at times, the country never emerged as a great maritime explorer. Overall, the Japanese have tended to be familiar with nearby waters, not far waters, engaging in fishing rather than exploring or seafaring. For the most part, the seas around Japan have served as boundaries rather than linkages with other lands. 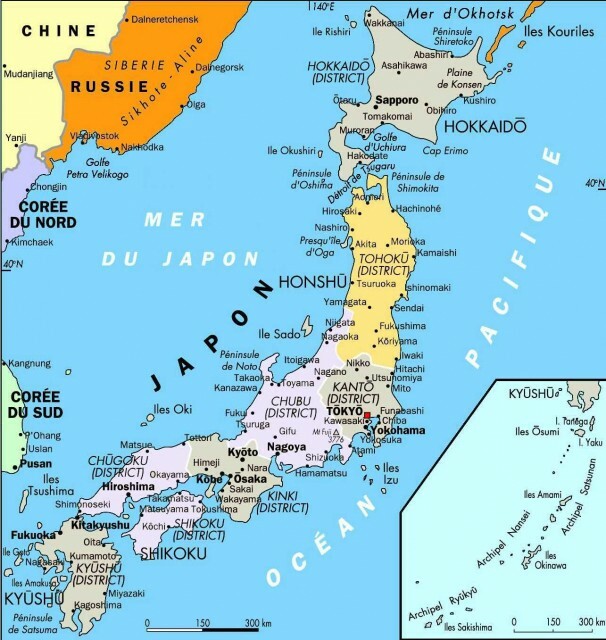 It was not until the 1700s that Japan charted its own coasts. Three-quarters of Japan is covered by mountains. This mountainous terrain is the product of the country’s geological origins. The Japanese islands were the product of plate tectonics, as the Pacific Plate and the Philippine Plate subducted (slid under) the eastern edge of the Eurasian Plate. After this process was already well under way, about 15 million years ago, the Sea of Japan opened in the gap between the emerging Japanese archipelago and the continent of Asia. The process of subduction is ongoing, driven by relentless if slow forces of PLATE TECTONICS. Japan’s geological history also explains the abundant natural hot springs found throughout the country. Seen from the ocean floor, the Japanese archipelago is the summit of huge underwater mountains, rising from the deepest trenches of the Pacific Ocean, sloping steeply away from Japan to depths of 33,000 ft (10,000 m) or more. From this perspective, the highest mountains in the world could be said to be in Japan. The Pacific Ocean side of Japan is rimmed with mountains ranging from 4,921 to 9,842 ft (1,500 to 3,000 m) high. Most of these mountains are volcanic, such as the country’s highest peak, the symmetrical volcanic cone of Mount Fuji (dormant since 1707). The western, Sea of Japan side of the country has lower, more moderate mountains, rising to heights of 1,640 to 4,921 ft (500 to 1,500 m). Some of the mountains of Japan are dormant volcanic cones, such as the beautiful Mt. Fuji. But dormant volcanoes can become active at any time. The southern island of Kyûshû has several active volcanoes, such as Mt. Aso. In 1990 another of these Kyûshû volcanoes, Mt. Unzen, suddenly became active after 198 years of dormancy. The previous time Mt. Unzen was active, in 1792, it generated an earthquake, landslide, and tidal wave (tsunami) that killed about 15,000. There have been nearly 1,300 recorded volcanic eruptions since the eruption of Mt. Aso in the year 710 C.E. Japan today remains an active locus of volcanic and seismic activity. Japan has more than 40 active volcanoes, and the country experiences an average of more than 1,000 seismic events (earthquakes and tremors) a year. The most disastrous earthquake of modern times hit the Tokyo/Yokohama area in 1923, killing an estimated 140,000. The worst earthquake since the 1923 disaster devastated the Kôbe area in 1995, killing more than 6,000. The mountainous origins of the archipelago makes flat areas rare. There are only five major plains, and none are very large. The Kantô Plain, by far the nation’s largest, with an area of 8,078 square mi (13,000 square km), extends inland from TOKYO. The other plains, all much smaller, include the Nôbi Plain near Nagoya, the Kinki Plain near Osaka and Kyoto, the Sendai Plain in northeast Honshû, and the Ishikari Plain on Hokkaidô. The mountainous topography of the land also means that Japan’s rivers are short, rapid, and torrential, typically carrying significant amounts of water only in the spring and summer months. The longest river, the Shinano, is only 228 mi (367 km) in length. None of Japan’s rivers is navigable for any significant length. Since Japanese mountains often rise directly from the water’s edge, there are only two natural deep-water ports in Japan: Kôbe facing the Inland Sea, and Yokohama, just south of Tokyo. Japan’s rugged mountainous terrain and lack of any major rivers has impeded transportation and communication until modern times. Today’s high-speed railway lines and highways are testimony to the extraordinary challenges and achievements of Japanese engineering. Long stretches of highways and rail lines are nearly continuous tunnels and bridges. Most Japanese people are aware of the impact of geography on their island nation. They will often recite phrases such as “we live on a rocky archipelago with few natural resources.” If Japan were a poor country today, people might point to its basic geographic features: a harsh and rocky island country with few natural resources. But while some modern Japanese continually stress how Japan is a harsh environment, stricken by earthquakes and volcanic eruptions and plagued by skimpy natural resources, this is more a problem in the 20th-century context of industrial Japan than in premodern times. Japanese industry today is highly dependent on imported raw materials, especially petroleum, and the need to pay for those imports helps to explain the urgent drive to export. But Japan was self-sufficient for most of its long history, and even today, Japan, outside urban congestion, is not an especially harsh environment, but a lovely country. The nurturing and beneficent side of Japan’s geography stems from its special climatic situation. Certainly, the high winds and torrential rains accompanying the seasonal typhoons (West Pacific hurricanes) that descend upon Japan can wreak terrible damage and destruction. But in general, climatic conditions have favored Japan. With the exception of parts of the northern island of Hokkaidô, Japan lies in the temperate climate zone. But there is tremendous regional variation, from semitropical regions in the south akin to northern FLORIDA to the cool temperate climate similar to New England in the northern regions. Indeed, as the distance between the northern island of Hokkaidô to the southern island of Kyûshû roughly corresponds to the distance between Maine and Florida, so do the climatic conditions of Japan vary to a corresponding degree. In the warm summer months, the reverse movement takes place. The air over central Asia becomes warmer, rises up, hence pulling moist air from the coasts toward the interior of Asia. This drops often heavy amounts of rain on the eastern regions of Asia (including all of Japan except the very far north of Hokkaidô) in the warm months. In sharp contrast to the precipitation pattern of northwestern Europe, where rains tend to fall in the cold winter months, the monsoon-induced rains of Asia fall exactly in the summer growing season. It is these rains that enable the wet paddy-field rice agriculture that has supported such high populations in Japan and in Asia since premodern times. Japan’s arable land may be quite small—only about 12 percent of the total land area is suited for cultivation—but it has been highly productive. The oceans surrounding Japan have been another great source of foodstuffs, raw and cooked. These rather fortuitous conditions have permitted a population of 40 or 50 million people in preindustrial times to live in an area about the size of MONTANA or California. The different regions of Japan are strikingly diverse and have distinct climatic and topographical characteristics. The country’s 47 prefectures are often grouped into eight separate regions, three for the outlying major islands, and five within the main island of Honshû. 1. The northern island of Hokkaidô has a far lessdense population and a colder climate than the rest of Japan. Some of Hokkaidô’s other features stem from its late development. Hokkaidô constitutes nearly 21 percent of Japan’s total land area, yet is home to only 5 percent of the Japanese population (5.7 million). The landscape includes soaring volcanic mountains, much hilly lowland, and flat terraces near the coasts, unlike terrain anywhere else in Japan. Agriculture, fishing, and tourism dominate Hokkaidô’s economy. Unlike the rest of the country, there is little industry in this northern island. The only major city in Hokkaidô is the prefecture’s capital, Sapporo, with a population of about 1.7 million. (Sapporo is the largest Japanese city north of Tokyo.) Japan’s northernmost island is separated by the Tsugaru Straits from Honshû. 2. Moving south across the Tsugaru Straits to the main island of Honshû, one enters the region known as Tôhoku (literally “Northeast”). Tôhoku occupies an intermediate position between Hokkaidô and the central region of Honshû in more ways than one. The region constitutes about 18 percent of Japan’s land area (slightly less than Hokkaidô) but has about 10 percent of its population (twice Hokkaidô’s). Hence, the region’s population density of 235 persons per square mi (46 persons per square km) is almost three times that of Hokkaidô’s, but substantially less than in other parts of Japan. Tôhoku includes six prefectures but, like Hokkaidô, is relatively underdeveloped when compared to the rest of Japan, with more of the population engaged in agriculture and less in manufacturing than in more developed regions. Like most of Japan, Tôhoku is hilly and mountainous, with few substantial plains or other flat areas. Like Hokkaidô, Tôhoku produces rice and attracts many tourists. 3. Southwest of Tôhoku is Chûbu (literally “the central part”), the large central region of Japan (and the widest part of the big island of Honshû). In this central zone, the terrain varies tremendously. There are four major subregions within this central zone. The mountainous region of Chûbu is the “rooftop” of Honshû, capped by the massive Hida, Kiso, and Akaishi mountain ranges that constitute the Japanese Alps. Many peaks in the Alps have elevations above 9,843 ft (3,000 m), and are snow-covered for most of the year. There are few flat areas in the mountainous parts of Chûbu, so the population is clustered in six small mountainous basins, where residents traditionally were engaged in silk production. The contrast with the Kantô region of Chûbu could hardly be greater. The Kantô region includes by far the largest flat area of the country, the Kantô Plain, extending inward from Tokyo, as well as many of the major manufacturing and population centers along the Pacific coast. The Kantô region includes seven prefectures and great concentrations of modern industry. Its population density is also by far the highest in the land. 4. Extending south from the Kantô region along the Pacific is the Tôkai region, a quieter and less developed part of central Japan, comprising three prefectures. The most important part of the Tôkai is a narrow band of land between the ocean and the mountains. The old Tôkaidô Highway traversed this strip in the Tokugawa period (1600–1868), and modern highways and railways still follow that route today. Further to the southwest in the Tôkai lie the second-largest flat part of Honshû, the Nôbi Plain, along with Japan’s third-largest city, Nagoya. The final region of the Chûbu, the narrow band of hilly country north of the Alps and adjacent to the Japan Sea, is known as Hokuriku, which encompasses four prefectures. The Tôkai region is much less developed than the superadvanced industrial zones of the Kantô, but the isolated Hokuriku region, on the “back side” of Japan, is even slower and less developed, although somewhat ahead of the northern Tôhoku region. The Hokuriku region is characterized by damp winter air and enormously heavy snowfall, as the winter monsoon winds passing over the Sea of Japan drop their wet cold snow on the region in sometimes astonishing quantities. 5. Moving further west along Honshû brings us to the region of Kansai. (Kansai, especially the part near the old capital of Kyoto is also referred to as Kinki.) From this area south, the subtropical climate of this part of Japan sets it apart from lands to the north and east. The southwestern part of Honshû is divided into the Kansai and Chûgoku regions, but the climatic tendency toward warm sunny weather generally affects the two islands of Shikoku and Kyûshû as well. The Kansai region is the second most densely populated and developed part of Japan after Kantô. Not only was this region the center of premodern Japan, it was home to the imperial capital of Kyoto for a thousand years. It is also a modern commercial and industrial zone. It encompasses six prefectures and three of the country’s largest cities, Kyoto, Osaka, and Kôbe. Kansai also features Japan’s largest freshwater body, Lake Biwa, source of water for Kyoto to its south. The ancient capitals of Kyoto and Nara, along with the nearby regions, are among Japan’s most-visited tourist destinations, for their temples, historical sites, and long pedigree. Osaka, merchant city of the Tokugawa age, remains a major industrial and commercial center, second only to metropolitan Tokyo. Though great quantities of goods are transshipped at Osaka, nearby Kôbe is one of Japan’s two great natural harbors (along with Yokohama), and serves as the main trading ENTREPOT for western Japan. 6. Continuing to the southwest from Kansai we arrive at the tip of Honshû and the region known as Chûgoku. Usually divided into San’in (“shady side”) facing the Sea of Japan to the north, and the San’yô (“sunny side”), facing the warm shallow waters of the Inland Sea to the south, Chûgoku is also home to the major industrial city of Hiroshima. Beyond Chûgogu lie the large islands of Kyûshû to the far west, and Shikoku to the south. Encircled by the three is the Inland Sea, which has served as a protected waterway since prehistoric times. 7. There are four prefectures on Shikoku, the smallest of Japan’s four main islands. Shikoku’s climate is even more subtropical than the Kinki region, and its agriculture includes mandarin oranges and other warm-weather crops. The island was also site of the traditional pilgrimage around the 88 Buddhist temples and monasteries of the island. Today’s pilgrims often make the same voyage not on foot but via tour bus. Shikoku remains less developed than the Chûgoku section of Honshû, which prompted the government to build the spectacular Seto-Ôhashi Bridge linking the island with Honshû via Awaji Island. Whether this bridge, or the proposal for a highway bypass along Shikoku’s northern shore, will bring further development is unclear. 8. Finally, at the southwestern tip of the main cluster of Japanese islands, Kyûshû is Japan’s third largest island, divided into seven prefectures. As we have seen, Kyûshû has some of Japan’s most active volcanoes and other mountains. In northwest Kyûshû are major coal fields (second only to Hokkaidô in production of coal) that provide much of Japan’s energy and are the location of major iron and steel plants. The island is mostly divided between an industrial north and an agricultural south. Kyûshû’s major cities include Fukuoka, Kitakyûshû, and the port city of Nagasaki. Between Kyûshû and the largest island of Honshû is the Shimonoseki Strait, spanned in modern times by the Kammon Bridge and three separate tunnels. Confucianism: The Branches and Leaves of Japanese Civilization?